Can I get a color besides black? BEST ANSWER: Sure, from another company. Yes, visit a local hardware store and ask for "Krylon". CDNN SPORTS has a great deal on sights. Are these ever coming back in stock? BEST ANSWER: Been waiting 2 months...still not stocked!! what is the height when deployed? I just bought them. Worked for me. Heat a concern with a plastic sight? BEST ANSWER: Will not be an issue for rear sight or free float rail mounted front sight, however front sight will warp/melt if mounted on gasblock. These sit on your hand guard. If it's not too hot for your hand then it's certainly not too hot for a polymer sight. To a certain degree yes. The rear is fine. The front is not recommended to direct mount to a gas block. No, I have never experienced any problems caused by heat with these sights. Unless your running full auto heat shouldn’t be a concern. 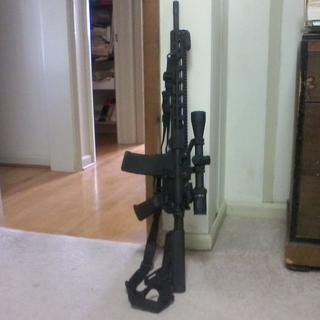 I have a 450 bushmaster on an AR 15 lower will these sights work with this? BEST ANSWER: Yes. They have a wide range of adjustment and aren't recoil sensitive. Thanks are they easy to install? Yes. Very easy. One screw each. I'm sure there are videos on Internet showing their install and adjustment. The tool to adjustment elevation on the front sight comes in the package. Yes they will, as long as you zero them for that specific caliber. Yes, they'll work on any AR in any caliber. Are these tall enough to co-witness with the Vortex Sparc ar? Out of stock for two months , when are you going to get them back in stock? Any way you fine folks at psa would send two rear sights as a set? Will these work with an AR pistol? BEST ANSWER: If it has a rail yes. As long as you have a hand guard that you can mount the front sight on, I see no reason why they would not. Great sights and when on sale this is the best deal bar none! Yes...have it on mine and it works great. Yes they would work on any AR platform. Yes, i have them on my AR pistol. I have a Rock River X-1 6.8spc, will this work on this model? Will this fit the PSA AR 10 platform? BEST ANSWER: Yes, as long as you have a MIL-STD-1913 Picatinny/STANAG 4694 receiver rail on the top of your PSA AR-10. Yes. I bought by last set specifically for that purpose. are these absolute co witness with a Trijicon MRO? BEST ANSWER: It depends on if you have an absolute co witness mount with your MRO. With a full co-witness mount yes. If you have a 1/3 then no. Will this pair up with the sig sauer romeo? BEST ANSWER: Yes I have paired these sights up with romeo 5's and 4's. They work nicely. These are standard height and most RDS these days have risers included or available that will co-witness. Absolute or 1/3 lower whichever you prefer. Mine did with my Romeo 5. I haven't tried them with the Romeo 4 or any of the others. Pairs perfectly with Romeo4M with included sig cowitness mount. Are these able to be mounted on the side as backup sights? BEST ANSWER: They could be. But one would have to get angled based. I'm using them as primaries at the moment. As they come...no. If you can come up with some angled pic rails then you could. If you have a rail they will absolutely mount on the side. Yes but you’ll need correct mount. Will these work on your Smith & Wesson AR-22 rifle? will this work on an Anderson AR 15 5.56 Rifle With 16" Barrel AM15-BR as purchased? BEST ANSWER: The AM15-BR only has a gas block rail to mount the optic and I wouldn't put a polymer sight on it since it will likely melt. This set works best on a free float handguard. Yes, these are great sights, and the best thing is that they keep the wieght low. They are the easiest of any sights to make adjustments to as well. I have a 9 slot picitanny rail and vortex-sparc-ar-1x-red-dot-scope will these sights work well and fit all correctly on my ar pistol set up? BEST ANSWER: They will. I have them behind a Romeo 4 and Juliet 4, and there is still space for them (rear stays down when Juliet is up). Yes, they will. In fact, they work well enough that I took the red dot off my 8.5" pistol, making it more compact. If I were to get these in another color (like fde), would dying them affect the flipping mechanism? BEST ANSWER: It’s hard to say. The sights are fairly tolerant to heat considering how hot an aluminum picattiny rail can get under rapid fire. However, fully submerging the sights into really hot water with dye may cause warping in some places, especially where the springs have tension. 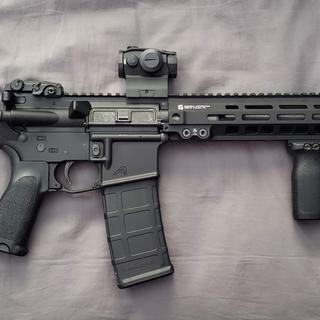 Fit on EQ-12 Gen2 Quad Rail from Aero? BEST ANSWER: These will fit any standard 1913 rail. will these work with holosun micro dot? BEST ANSWER: As long as you get one with the "1/3 Co-witness mount" in my opinion. It will work, but I have not had a holosun to try, but I have used these sites with many of the budget-friendly red dots. you just have to be sure it has 1/3 co-witness and go from there. Yes. It work with micro dot. Are these compatible with a 300 blackout pistol? can you ship it to Philippines sir? So, they said price too low to advertise, and had to put in cat and apply code to see. Normally with other sites, that is a gimmick and its a crap 3 or 4% discount. Umm.. not here it's legit and worth it. Best sale price on these anywhere. Outstanding quality product, easy to install and very functional. I added this to my PSA AR-10 and glad I did. Highly recommend this back-up sight. Excellent price. Works well. Shipping time was OK - not the fastest, but for the price, it was worth the little wait. Great price on a great product I use MBUS on all my ARs. Great sights for a great price. Simple as that. Easy to install, easy to adjust for sighting in, functions smoothly when flipping up or folding down. Tinking steel at 100 and 200 yds is no problem even for me, a newer(ish) shooter, on my first (and only) AR15. Mounted front and rear Magpul Gen 2 MBUS from PSA to my Ruger MPR for the backup sights ----> they work Great!! The rear one tucks in nicely under a 3-9x40 Burris Fullfield E1 illuminated dot 3 post reticle, held up by a Weaver 1" SPR thumbnut mount. Front and read Magpul Gen 2 MBUS on Ruger MPR. Works wonderfully well. Easy to install. Simple to use. The price was quite good. At $50, the quality, and function can't be beat. i couldnt understand WHY these plastic sights were so much more money than all the other plastic sights out there. I will say these are HIGH QUALITY, well made, and probably worth the $$, but dang it's hard to justify pulling the trigger on purchasing these. But they are a cut above the competition. Great sale price on Magpul sight. While not top tier, there sights get the job done. I haven't used these in extreme cold yet nor have I abused a set but thus far they have held up well. I have had one set for over a year and they are still spot on. 4 stars are for the normal price. Both sets I got at PSA over a year apart I was able to get on sale. I suppose at the sale price they really should have 5 stars as they are truly a value on sale. Awesome sights! Easy to assemble; solid build; functionally sound! Great deal as always! Quick and Easy transaction!! These Magpul sights are lightweight and hold zero perfectly, and with this price from PSA, they are hard to beat. Would recommend for light duty backup sight. Shipped in a timely fashion. Installed and adjusted easily. These are great back up sights for the money. Very accurate. I will say they are a little wider than some others and makes it a little more difficult to mount a flashlight or something else next to them just because of clearance issues. And they are plastic so I wouldn’t go around slamming them on the ground expecting them not to break. If you are just using them as backup sights on a gun you are NOT going to take to war, then I would say they will be just fine. Quality product just like everything magpul that I have bought. PSA ships quick with a good price. I have these on a few weapons. I bought an AR9 from PSA and mounted a cheap set I had laying around on it. They didn’t have enough adjustment to zero, so I waited until PSA had these on sale, and grabbed a set. Did the job just fine. Yes they are plastic and cheap. But that doesn't mean they arent worth it. If your using your irons for primary duty use, I suggest looking somewhere else. However, I think they are the perfect back up sights for most people. If you're planning to use a red dot, holo, or magnified scope as your primary and only ever expect to use irons in an emergency/jam, these are the ones for you. Stays mounted to the rail just fine, even comes with some locktite-esque stuff on the screws. Are there ones better than it? Of course. But at this price when PSA has them on sale, you really cant do any better. Can't go wrong with Magpul. Highly recommended! Seems to be well made and sturdy. Can’t speak for the longevity as I have only had it a short time. The price ain’t bad if you catch them on sale. Easy to mount, but not as I expected. They feel backwards compared to what was stock on a Ruger AR. Nylon popup sights. What more can you ask for at this price? 5-stars. These Magpul Gen 2 MBUS flip up sights are absolutely fine. They are tough, adjust easily, work just fine and lock in the down position when not needed. Flip them up by pressing the levers and they lock and will co witness with red dots. Price is right too. Yes I do recommend. Magpul, what's not to like? Excellent quality and a great price! I believe I have 5 or 6 sets of these now! Perfect for what i needed. PSA was very fast to ship, recieved in 3 days after ordering. Installed the front and rear B/U sights set on my PSA AR-15 CHF build which has a replacement Leapers UTG free-float rail. Great fit and function! Well made, just as I expected. Great for open sites or back up use. Mine arrived earlier than expected. 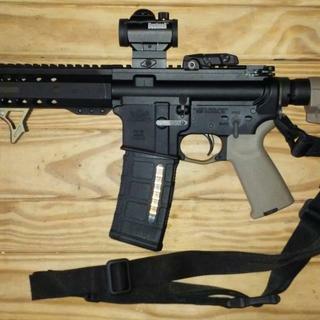 I have never been disappointed with Magpul or with palmetto! Great price on these as a combo deal but personally wouldn't want to buy them at full retail. They work perfectly and coaligned with my red dot right out of the box.